Suddenly, a bearded stranger with a twinkle in his eye takes a seat and begins spinning a provocative tale that intrigues, delights, and inspires. 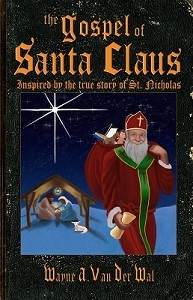 Masterfully weaving past and present through story, lessons, and devotions, The Gospel of Santa Claus follows the incredible story of Saint Nicholas. A meaningful, touching story to be shared with the entire family, Wayne Van Der Wal's powerful historical novel will raise important questions, ignite hope, and reaffirm your faith in God.